NO SALES TAX on orders shipped to locations outside of Texas. That means you could save up to 10% in tax. What is UV? Ultraviolet light is a range of the electromagnetic spectrum, lying between visible light and X-rays. That may be meaningless to you, so look at it this way. You probably have some actinic lights on your reef aquarium. Actinic lights have a wavelength of 420 nanometers; UV falls just below (i.e. shorter wavelength) that pretty, violet light we call actinic. As most beach-goers know, UV light can be dangerous. The very short wavelength of UV allows it to slip past cell walls, scrambling the delicate chromosomes within. In people this can lead to skin problems; in single-celled organisms, like many that cause disease in fish, this scrambling is an instant death blow. Don’t let this scare you away. When used correctly, UV sterilizers pose no threat to the aquarist or the aquarium's desired inhabitants. There's no need to put on sunscreen when using UV in your aquarium. UV Light for Your Aquarium? Yea or Nay. Although UV sterilization has been around for a long time, aquarists still debate its use. There are some who claim that it isn’t really necessary, and others who've found it to be highly effective, mainly in controlling fish disease. As with most debates, the truth lies somewhere in between the two extremes. It's the goal of this article to provide basic information on the use of UV sterilizers (particularly as they relate to reef systems although they are often valuable in both freshwater and saltwater aquariums as well), and allow the reader to decide if it will be useful for their particular application. 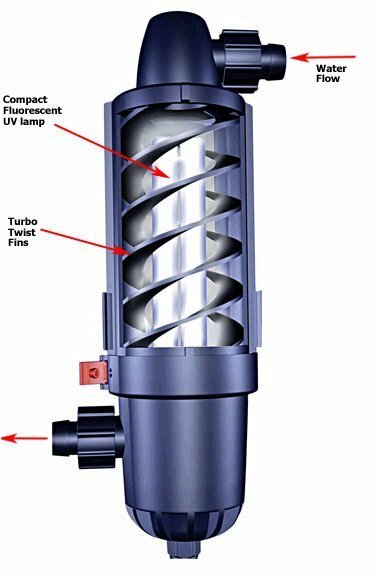 If UV interests you, many of the newer aquarium canister filters now incorporate a UV chamber. What is a UV Sterilizer? A UV sterilizer is basically a small enclosure that contains a UV-emitting fluorescent light bulb. (This bulb is, in fact, just like an ordinary fluorescent bulb, minus the white powdery phosphors coating the inside.) The bulb is enclosed in a transparent tube, often made of quartz, that allows the water to pass very close to the bulb without it getting wet. Water passing through the tube is exposed to the UV light, usually killing any and all parasites in the water. There are two important factors that determine the efficacy of a UV sterilizer. The first is water clarity and the second is 'dwell time', and both are explained below. Because of its very short wavelength UV light is very easily blocked. If the aquarium water is cloudy, discolored or full of particulate matter, then the UV will be blocked and never reach the problem organisms. For this reason it's important that water is filtered before entering the UV sterilizer. A good protein skimmer and generous use of activated carbon are both great ways to keep water clarity up, and both help maximize the efficacy of a UV sterilizer. The second important factor is dwell time. Dwell time is simply a measure of how quickly the water flows through the sterilizer, or how long the water 'dwells' in the sterilizer. If the water flows too quickly, then the bad guys will zip through unharmed. If it passes through too slowly, then the sterilizing capacity of the unit will be decreased because enough water doesn't get exposed often enough. To prolong the time that water is exposed to the light without elongating the light bulb beyond practicality, nearly all modern UV sterilizers have some type of spiral round-and-round flow rather than a straight-through water passage. (image below right) All manufacturers of UV sterilizers give suggested flow rates, in gallons per hour (GPH), for their units. All the user needs to do is select a pump or powerhead that will provide the correct GPH. And remember, that pump should be drawing water from the cleanest part of the aquarium, usually just after the protein skimmer and activated carbon. Most people who use UV do so to help combat fish diseases such as Oodinium (Velvet), Brooklynella and Cryptocaryon (Marine Ich) and Ichthyophthirius (Freshwater Ich). Medications are available to directly treat these diseases. But most, if not all, of them cannot be used in a reef aquarium because of the harm (or, more accurately, death) they cause to the reef’s biological filtration and invertebrates like snails, shrimp and corals. Given the toxicity of most medications, UV often becomes the best option, or the only option, especially when the diseased fish cannot be removed and treated in a separate hospital tank. Now here’s the catch. UV sterilizers can only kill the free-swimming stage of these fish pathogens. Most fish diseases have multi-stage life cycles, including a period where they settle on the substrate. Obviously, the UV sterilizer cannot do anything to substrate-bound organisms. It can only kill the free-swimming stage, when the pathogens are in the water column and able to be passed through the sterilizer. For this reason, a UV sterilizer needs to be run continuously, even for several weeks after the last symptoms disappear. Most UV users keep the unit running 24/7, even when all fish are healthy. Maintenance of a UV sterilizer is very simple. Every couple of months the unit should be disassembled and inspected. You just need to take a look and clean off any algae or detritus that may have settled on the inner pieces. You also need to check that the bulb is still working. Unlike ordinary aquarium lights, UV bulbs do not suffer from spectrum shift over time, so as long as the bulb is emitting light it is still useful and effective. However, and this is very important, you should never look directly at the bulb when it’s turned on as this could cause eye damage. Most UV sterilizers have a small ‘window’ in the enclosure that allows you to safely see if the bulb is working. It’s recommended that you select a unit with this feature. Before we wrap this up there’s another benefit that should be mentioned: UV sterilizers are effective at killing free-floating algae. This is the stuff that settles on the aquarium glass and gives it that green tint. Many aquarists have been pleasantly surprised that they need to clean the glass much less frequently when using UV. Many have noted that water clarity is also often improved by using UV. So all in all UV sterilizers are a unique piece of aquarium equipment. They fill an important role by providing an excellent alternative to harsh chemical medications. Given their low cost, relative to the price of often very expensive fish, many aquarists see them as being well worth the investment. If you decide to purchase one for your aquarium just make sure you consider the factors mentioned above, and also purchase a unit that’s correctly sized for your needs. Your fish may never need that extra protection, but in this hobby, it never hurts to have an extra safety net below!